Each year, an estimated 65,000 undocumented students graduate from high school. Many of these students dream of pursuing higher education, but they face significant hurdles due to their lack of legal status. 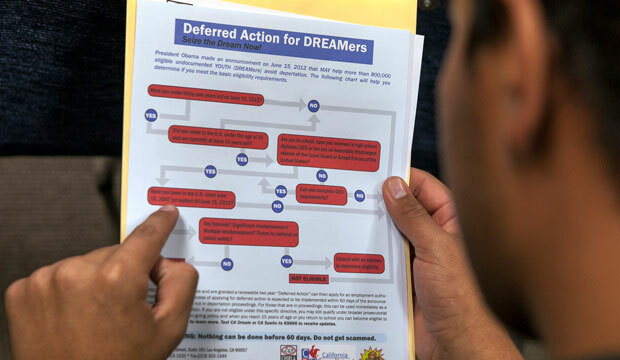 In June 2012, President Barack Obama announced the Deferred Action for Childhood Arrivals, or DACA, program, which provides temporary relief from deportation for eligible undocumented young adults, as well as renewable two-year work permits. As of January 2015, close to 640,000 people had obtained DACA status out of the 720,000 applicants. DACA has eased many of the burdens that undocumented students face in higher education—from gaining access to in-state tuition in many states, to being able to work legally for higher wages, to added job security after graduation. In November, the president announced a series of Department of Homeland Security, or DHS, immigration directives, including an expansion of the DACA program that will cover older DREAMers who did not meet the 2012 age restriction and cut-off date. The expansion is currently on hold pending a federal court decision, but once implemented, it will give up to 300,000 more young people a chance to succeed in higher education and to use their skills and training in the workforce. In turn, these DACA recipients will play a big role in the nation’s economic future. Undocumented young people face a number of barriers when it comes to accessing and obtaining higher education, such as paying tuition and living expenses; obtaining a job to support themselves and, often, their families while studying; and overcoming other psychological obstacles such as anxiety, stress, and feelings of exclusion. Having the temporary protection and work authorization that DACA provides helps with all of these issues. A major barrier for undocumented students is the cost of higher education. The average tuition and fees for public four-year institutions have risen by 5 percent per year over the past decade, and many states do not allow undocumented students to access in-state tuition or state financial aid benefits. Undocumented students also are not eligible for federal financial aid, including Pell Grants, which makes it difficult for them to finance their education. With the Social Security number they receive as part of DACA, students can fill out a Free Application for Federal Student Aid, or FAFSA, and receive their Expected Family Contribution number. With this number, students can access institutional support in certain states and at certain universities, something they could not do without a Social Security number. Currently, 24 states allow DACA beneficiaries to pay in-state tuition rates and apply for education grants. DACA eases financial pressures on students and allows them to obtain new and higher-paying jobs. In a survey done by Harvard University sociologist Roberto Gonzales of DACA-eligible youth, 60 percent of beneficiaries reported obtaining a new job and 45 percent reported increased earnings. Studies have shown that people who receive temporary work permits end up with 8.5 percent higher wages, on average; this translates into more money to support both family members and education. In many cases, DACA has significantly improved the financial position of beneficiaries by allowing them to work shorter, more regular hours and earn fairer wages—all of which help eliminate stress and anxiety. Indeed, beyond the economic benefits, DACA has helped undocumented students overcome psychological barriers to success, such as the feelings of exclusion, anxiety, and stress brought on by their unauthorized status, as well as their precarious finances and sense of isolation. In a University of California, Los Angeles, study, undocumented undergraduate students reported high levels of anxiety because of their lack of legal status. DACA has helped build a sense of inclusion among these students, allowing them to integrate into their institutions and mainstream society. In a survey by University of California, San Diego political scientist Tom Wong, 64 percent of undocumented Millennials stated that they felt “a greater sense of belonging in the United States” after receiving DACA. Additionally, Gonzales’s research on DACA beneficiaries found that given their lack of work authorization, undocumented young adults who graduate from college have trouble finding jobs that match their educational credentials and abilities due to their lack of work authorization. With DACA, these graduates can find jobs that utilize their skills and can develop new ones through internships and employment to which they would not otherwise have had access. Part of the November DHS immigration directives was an expansion of the DACA program to cover individuals who did not meet the cutoff of ages 31 and younger on June 15, 2012—the date the program was announced. The expansion also moves up the eligibility date for people who were continuously in the country as of January 1, 2010. This change brings nearly an additional 300,000 potential beneficiaries into DACA, making a total of approximately 1.5 million people immediately eligible. These older DREAMers will now also have a chance to work legally and to return to any higher education they may have had to put on the back burner. While hundreds of thousands of young people have already received DACA and are able to work legally and access higher education, the DACA expansion is currently on hold. On February 16, in response to a lawsuit challenging the DHS directives, Judge Andrew Hanen of the Southern District of Texas temporarily blocked the expansion of the DACA program from moving forward, pending a Department of Justice appeal. Delaying the DACA expansion means leaving hundreds of thousands of DREAMers in limbo, unable to fully use their skills and training or to fully access the higher-education benefits available to their younger counterparts. Ultimately, while the DACA expansion will help reduce higher-education barriers for undocumented students, it cannot eliminate all obstacles completely. Financial, legal, and cultural barriers still exist, even for students who have DACA’s temporary legal protection. Often, undocumented students come from lower-income families, and many are forced to choose between college and employment. For example, DACA beneficiaries are sometimes their families’ only form of financial support and are therefore forced to delay their education in order to provide for them. To completely eliminate these barriers, Congress needs to pass immigration reform that includes a pathway to citizenship for all of America’s undocumented immigrants in order to provide them with equal access and inclusion in higher education and the economy. Sanam Malik is the Special Assistant for the Immigration team at the Center for American Progress.